The Samsung SyncMaster 225BW LCD monitor does not support pivoting. However, modifying the monitor so that it is fixed in portrait mode proved to be very easy. After it is done, the height adjustment of the stand is affected – in its highest position the bottom of the screen bezel is about 87mm from the desk. In its lowest position it touches the monitor stand. Tilting is not affected. 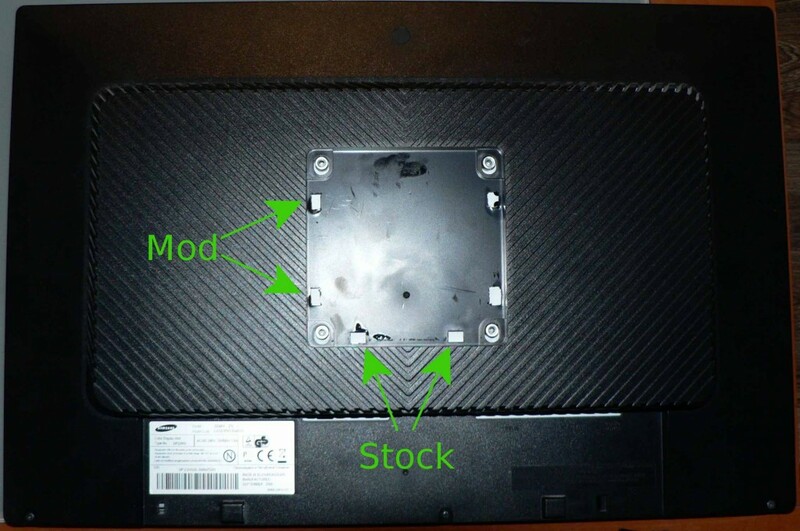 Remove the back plastic cover of the monitor – three screws along the bottom edge. Then use a prying tool to snap off the cover. Start on the bottom edge, then the sides and finally the top edge. Use a special spudger tool or improvise something made of wood or plastic in order not to damage the parts. You only need to make additional holes for the hooks – the screws can be put back in any position, the threads are there already. I used a scalpel together with a hot air soldering station (200C setting makes the plastic easy to cut but does not melt or burn it). Two holes are needed, but I made the other ones just in case I change my mind and decide to hang the monitor upside down for better cable management. Wondering how you were able to position the new holes correctly. Through careful measurement? Also, instead of cutting the holes, would removing the nubs that are supposed to fit in the holes have worked? I think I used either a caliper or a ruler to mark the positions. Removing the nubs would be somewhat harder since they are made of steel. Also, if you decide to put the monitor back to landscape mode, tilting could become a problem – the monitor would only hang by the top screws. The holes don’t have to be precise, I suggest you make them smaller at first and adjust later.